I've spent some time with FF14 in its open beta over the last week. The game is very reminiscent of FFXI in that it isn't going to hold your hand through anything, and I am perfectly OK with that if that is type of game SE is pitching. But they are hyping this casual-friendly, non-punishing, happy-go-lucky MMORPG where everyone gets their nose wiped and bad times are a thing of the past. Whoever approaches FF14 with that predisposition is going to experience something completely disjoint from their expectations. The most significant and show-stopping issues with the game deal with the interface and controls. It is as if they pinned up a keyboard sketch and bound functions to whatever keys the dart happened to land on. As of this writing, there is no way to officially remap keys. The controls were so obstructive that my first few sessions were only 10 minutes long, and I had to log off in frustration. 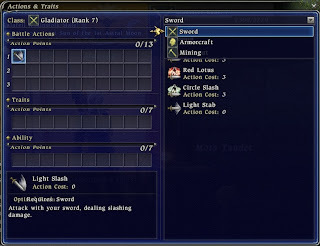 In FFXI I could play without the mouse because I used the numpad for movement, menus, targeting, and confirming actions; the arrow keys for camera and item selection; and used my left hand to perform skills with alt/ctrl+#. SE decided to keep the familiar numpad binds, but not the arrow key camera controls. So I need to use IJKL or the mouse to control the camera. A WASD/mouse scheme would work well except that the mouse is rendered on a software layer and thus is unresponsive to the point of unusability. I've been getting by with using a full keyboard setup: movement with numpad, camera with IJKL when I need to. 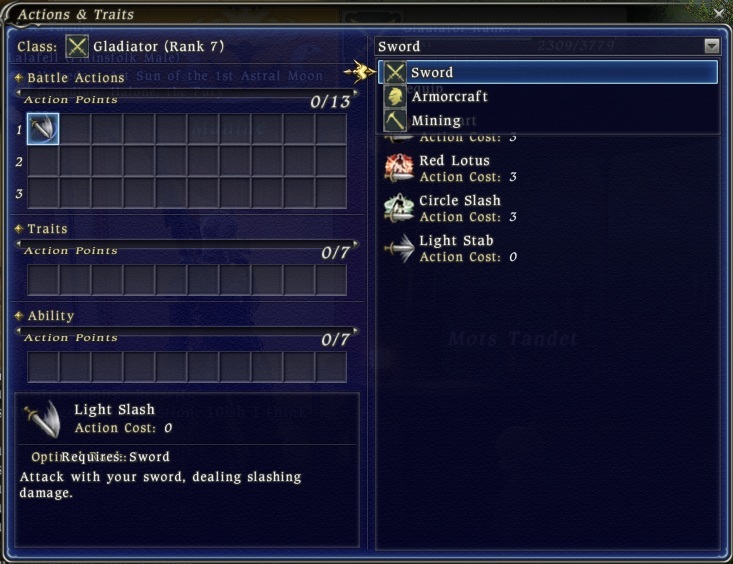 Some of the FFXI slash commands are in FF14 except for their shorthand aliases. E.g. instead of /cm p to change default chat to party, I must type out /chatmode party. I did not discover a PM reply shortkey or slash command; only after I type out the character name in a /tell does ctrl+r auto-populate a reply for me. These are just minor annoyances. The basic resource in combat is Stamina which operates exactly like WoW's Rogue Energy mechanic or Global Agenda's combat: each ability depletes some amount of Stamina, but Stamina refills fairly quickly. There is no auto-attack. Prior to realizing that I had another skill at my disposal, I was simply hitting '1' over and over again, and cried with boredom, "This is it?" With the aid of my friend (and the audience around the Aetheryte Crystal I pissed off by bitching about the game in spacial chat), I found out that jobs get new skillz every even level. And in fact once a player completes the intro scene (and subsequently hits Lv.2), they should have at least 2 skills. This makes combat slightly more interesting (although as a Gladiator, my Lv.2 skill requires MP; and MP doesn't refill unless you return to the Crystal...). Explaining to players that they have new skills and how to find/equip them are obviously not priorities at SE. I leveled several jobs to around Rank 4 before I even realized that I acquired new abilities. In the Abilities menu, there should be a drop down box on the right. It defaults to nothing (which is completely moronic); if you select a weapon from the list, then equippable skills will be shown. Upon hitting Lv.6 I got a skill that required only Stamina and TP, so this actually did add choice during fighting. The skill was also AOE, and since we were duoing mobs without a problem I started to engage and pull them near each other in order to make things go a bit quicker. My two-player party was out in the field just killing mobs without any real guidance. Guild Leves (AKA quests) will not fill up a complete play session unless that session is very short. Expect to kill mobs without a quest prompt telling you to do so. I'm not entirely sure how the mob relative strength gauging works. We were primarily killing blue-con mobs, but we tried to fight a blue monkey once and got killed quickly. 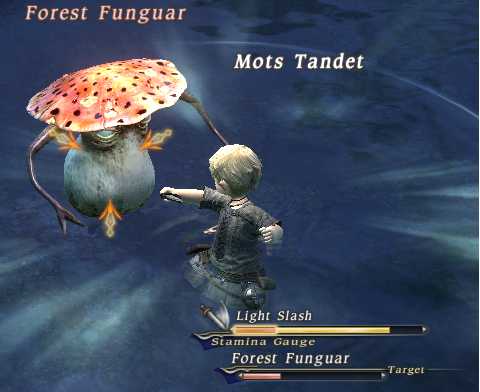 Also, like its predecessor, FF14 doesn't indicate what mobs aggro (and perhaps how they aggro). The first time I died, my body lay on the ground for 5 minutes while I awaited a GUI popup with some options. None such message was displayed, and I eventually found a "Return" option in the main menu. This teleported me back to the Aetheryte Crystal. I found the death penalty to be contradictory. Returning to the Crystal waypoint debuffs the character with "Weakness". This status effect reduces its HP, MP, and Stamina regeneration rate. So the player is pretty much just waiting around for this to wear off before setting out again. For an MMORPG that is supposed to be catering to the casual crowd I find this mechanic to be defective. Displacing the player is already a loss of time; why make them wait around even further? I didn't experience all the Disciplines of the Land (AKA Gathering jobs) first-hand, but I am willing to bet they all operate the same way. Gathering professions can equip some skills that help players find resource nodes, giving distance in "yalms" and a compass direction. One ability even provides a sprint buff if the player is far away from the closest node. Nodes aren't "claimed" as they are in WoW. Anyone nearby or late to the show can walk up and start gathering from the same node. Each player get a personalized Attempt count. Once a player runs out of Attempts, she's gotta move on. The node itself seems to have a global Attempt counter and will deplete eventually if enough people gather from it. The act of gathering is a simple pattern matching hot-cold guessing game. Players get 3 or 4 guesses along a meter. An indicator moves back and forth along the meter and hitting Confirm places the guess. The game responds with text clues indicating if the guess is way off, going in the wrong direction, close, or very close. If a very close message is presented, guessing the same location again seems to still produce an item. It is possible to guess correctly on the first try. Before the minigame starts, the gatherer indicate "where" they would like to gather. It is a height meter indicating, for example, the depth at which you want to fish. I have a hunch that it skews the probabilities of receiving certain items. I seem to find Copper Ore near the top of the meter, while I often strike Tin when mining near the bottom. Synthesis in FF14 is very similar to that in FFXI, except there are some additional options. The familiar 8-cell grid for materials is present, and players still have to discover recipes. The UI is extremely slow; a single synth took 5 mins. The game even froze for 2 seconds (looked like blocking network i/o to me) each time the materials grid was displayed. I have a feeling all the crafting professions are very tightly coupled. So players are expected either to level multiple Disciple of the Hand jobs (lol), or to pay out the nose for refined materials. And with no Auction House, things might get a bit frustrating. I didn't get past rank 1 Armorer and cannot fathom how someone could level a Crafter primarily. When information was first breaking about some of the systems in FF14, I feared it would fall flat on its face. But now I see that it does carry on the FFXI legacy, and all those players will enjoy it very much. I'm willing to bet that the instruction manual goes through a lot of the basics (like how to equip skills and to accept defeat). It would be nice to have in-game guidance, especially in a post-WoW MMORPG--pop-ups, tutorials, some form of assistance on how to use the UI. But once again those are GUI concerns, and that department doesn't seem to exist at SE. This is a far more honest and forgiving review(look) that I've read on this game. I have the beta and don't like the game, but I never was able to understand the sheer hatred generated from this game. Coming from games like Darkfall this UI seems intuitive and user friendly. That aside I eventually got around the mouse lag too. It's just the game I didn't really enjoy. But most forums are filled with hate on this game based on 2 small but glaring issues. I think the hate stems from the Bait and Switch. Whether or not SE explicitly said the game was intended for a more casual audience, by simply reading the features and systems that were marketed to players it is hard to not make that assumption. Even I was fooled. Yes, things like experience capping and free waypoint access are certainly very different from FFXI. But I think a lot of players wanted the game to be WoW with Final Fantasy graphics. So perhaps these players realized that SE did not actually make the game that they wanted? Keep in mind FFXI was one of the most populous MMORPGs before WoW, and even after WoW the game still held strong. Maybe its franchise loyalty, or maybe SE actually carved out a niche and knows what they are doing. I leveled Alchemy up to level 4 or so just by doing the crafting quests. This is also apparently how you discover new recipes. Each quest gave me a level, and for each I had to make an item with materials for it being provided. Seems like the whole crafting thing is a pain the way it is. Everyone around you selling cooking supplies or elemental crystals (in quantities I didn't think could be gathered by now) doesn't make things easier, though that's not really the game's fault. I failed one of my Armorer quests because I had no idea what any of the "synthesis" options did. I figured the craft required a healthy mix of Bold, Regular, and Rapid. I later read that that is not the case, and unless I am aiming for HQ results, I should stick with Regular (only using Rapid for Hail Mary situations). Mots, in reply to you first reply. I suppose I had little to no expectations for this game unlike so many others. But I expected a complete mess after reading mmorpg forums. And what I experienced was a pretty well put together game. I just wished I liked it more, but that hardly warranted a comment on the forums so all I can do is look on with wonder at the frenzy of naysayers. Noted: today there is an uproar of "NANNER NANNER!" from the fans of FFXIV due to the latest patch. Oh drama how I loathe you. * We believe that the item selection interface should be very responsive, and by release we will have introduced a MUCH improved version. After release we will continue improving this. * The FFXIV development team acknowledged that there's issues with the mouse and user interface and apologized about it. Hardware Mouse + UI improvements will be a major focus for them. Well then... I guess I'll have to see what happens at release. My only criticism is that the guy doesn't know that the Fatigue system was first envisioned by Blizzard for WoW and is currently known as Rest Experience. The difference being that Blizzard's system never went to 0%. I'm not entirely sure what he meant in that video. He says "The players who can play more can level more horizontally, making it a fair compromise." I think that would really depend on the context of fair. The only reason it really matters if players can reach max level is if there are things to do at that level that can't be done otherwise. If there isn't, then such a system becomes entirely unnecessary. If there is, then the people who have more time can still become much more powerful (as they clearly stated in the video) and thus more useful in those activities. While this does allow for those slower players to participate, hopefully it doesn't make them gimped and unwanted in groups. That would be no different than just having a regular levelling curve in which they had to finished hitting the max. I guess he never specifically said that FF14's Fatigue system is "revolutionary", just Fatigue systems in general. This sounds to me that players will be expected to have different jobs leveled in much the same way that players in FFXI were expected to have many SubJobs for a variety of situations. Of course that depends on how greatly players are corralled into parties: no one will care that you are a Samurai/BlackMage if you are solo. I was watching a fancy FFXIV tutorial on the fatigue/level system and I was reminded of how one got zero experience points in a dungeon and dragons game after slaying a monster for the n'th time. this is a well written review, and pretty much reflects my reaction as well. As a previous XI fangirl, I was thoroughly looking forward to XIV, but closed beta pretty much killed that dream. If I know Square, and I'd like to think I do after all this time, none of the major issues will see a fix anywhere in the near future, if eve, as many of the issues seem to be intentional. Much of the hate definitely stems from people looking for a WoW replacement and being sorely dissappointed. What kills it for me is they had so much POTENTIAL for greatness, especially building on an amazing title like XI, and it's like they worked in reverse. Throughout much of testing, the developers completely ignored some very valid tester feedback that probably could have saved the game. Many of the people try to compare it to WoW, or are looking for WoW-like features, because, frankly, WoW is a shining example of developement done properly. They took the idea started with EQ and said "let's do this, but do it better". To their credit, Blizzard made alot of innovations within the genre, improving on unnescesary or cumberson staples in game mechanics. They definitely have the most responsive UI. By comparisson, XIV seems to devolve backwards into many mechanics and gaming conventions of yesteryear. They were left in the past for a reason, guys. In the end, despite all it's promise and potention, XIV was a huge let down. The game is a particularly beautiful cookie cutter asian grindfest disguised as AAA MMORPG. Blizzard does UI very well. I really wish more studios spent more time on UI--they'd get a higher ROI than spending 200 man hours on getting that particle system to look perfect or making sure voice syncs with mouth animations. Since the CE dropped a couple of days ago, we know that SE followed through on their promises. There is a hardware mouse, and some of the GUI (like vendor interaction and crafting) have become more responsive. Changing disciplines no longer clears your action bars. There are still some design elements that are proving to be issues for players: Guildleve cooldown has been reduced from 48 hours to 36. Surprisingly, no one seems to be complaining about the weekly experience cap. I'm glad that Anima (the invisible resource that is used to Teleport to waypoints) recharges at a rate which requires players to actually manage it and think about Teleporting. Traveling is a big deal in FFXI, and I am relieved that SE didn't design a waypoint system akin to Guild Wars. Blizzard does UI horribly, which is why you need player created add-ons for everything. You can even drag anything around. FFXIV is more "casual" that FFXI because you can solo. There is a lot too do and it is not a race to end-game. You really will need to level more than one class to get certain abilities. All armor is player crafted, the crafting system is great. Reminds me of how eq2 crafting was originally, crafters are co-dependant on each other. The npc only repairs your armor to 50%, you need players to repair you to 100%. While the game is fairly quiet you because of no chat channels other than /say and /shout, a Linkshell (guild) is necessary. All these things do build community as you need help from others for various things. But, you can get by going it alone too. User Interface is more than just the Graphical User Interface. And Blizzard makes more than WoW. In response to that anon comment, no, there is not a lot to do. Prior to twenty, there's Guildleves and grinding (Whether battling or crafting), Quest every 10 levels. After 20, you can add faction leves to the list. And leves take maybe 10 minutes each. These issues are killing the game for me, but I still play it. I have a good linkshell and we have fun together. Soloing is not "casual". Or at least, not by a proper definition of what a casual game should be. Heh. To the editors: I've been reading through the archives and have found a lot of your articles really fascinating. Is this project on indefinite hiatus or are there plans to pick it back up for the new year? Thanks! I have a number of half-finished articles that I'm slowly working on. Should have some new stuff soon. If you'd like to discuss articles directly with me instead of using comments, send me an email at evizaer@gmail.com. I had some comments on RIFT, but they pretty much boiled down to "Global Cooldown is crap." I've been keeping busy with TF2 and board games.